Last February I went on holiday with my girlfriend, we went to Barcelona and then to Tenerife. We had planned for this trip for a while and it was an opportunity to relax after a lot of stressful work! I will add that every time I take pictures I always ask the other dimension if it's possible for someone to show up on my pictures, and just before I left I also asked if there could possibly be someone to accompany us. One evening in an e-mail that I wrote to Sara Luce, alerting us of my impending departure, I wrote: "Every time I wish for somebody to appear on one of my photographs, it never happens!" and Sara sweetly told me not to worry about it. 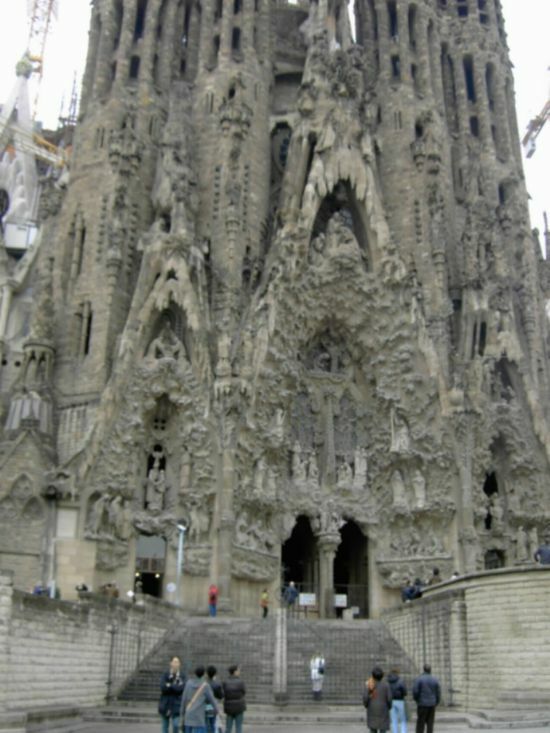 This time I must say the pictures made me look like a fool in front of Sara, because the very first picture that I took on my last trip was precisely when we visited the Sagrada Familia, the day after we had arrived. We were astonished to see the pictures after we downloaded them on the computer. 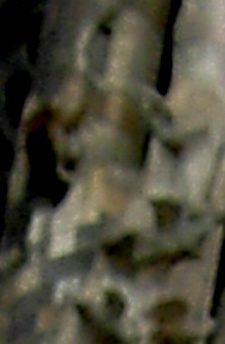 I see a man between the external columns of the Church, and if I zoom in the picture I discover that it's an Angel with a bunch of flowers! 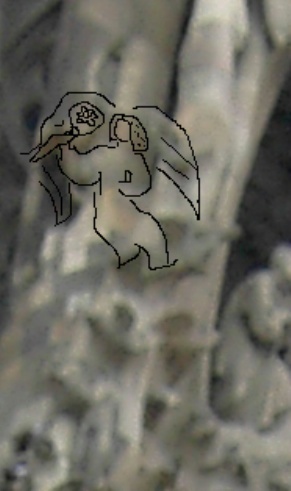 Look on the left hand side immediately after the coronation of the Madonna of the Assumption (the representation in the little nook), there is an Angel, sitting down, a blonde Angel with long and curly hair and in his hand he has, you guessed it, a bunch of flowers. I asked Sara Luce what she thought of it and she answered "from what She told us, it was right at that moment, at the time of the Assumption to the Sky, that she chose to be the Mother of all of us as the Mother of Jesus. She told me that she always carries a bunch of flowers with her and each one of these flowers represents on of her children, a child who will visit that day. Therefore for me, the Angel that carries a bunch of flowers during his coronation, carries this meaning"
Now look at the detail, and, as always to help you, the highlighted section.